26 days til start date…Tantrum Time! Okay, I’ve put it off long enough…I’ve been forced to start the daunting task of planning my resupply boxes and town stops. I have to say that this part of the planning has, by far, been the most unenjoyable part of this whole process. I just can’t stand it! Every time I sit down to plan my food, I feel like a three year old that didn’t get her afternoon nap. I can’t even begin to tell you how annoying this process is for me. It’s like packing a never ending suitcase! I started by mapping out my route using Craig’s PCT Planner. This is an amazing (and free) site that helps PCTers to map out resupply locations and how many days they have between resupplies. 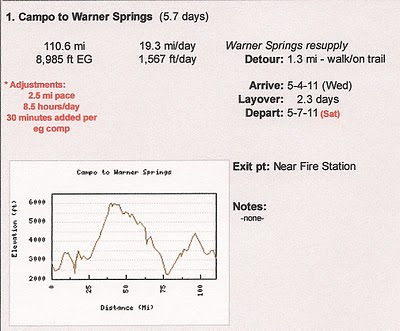 Craig has even included a calculation of estimated miles that can be completed each day depending on your expected pace and amount of hours hiked each day, while also accounting for a slower pace with elevation increases. As it turns out, Craig lives near me in Portland and we may get a chance to do a hike before I leave (small world!). 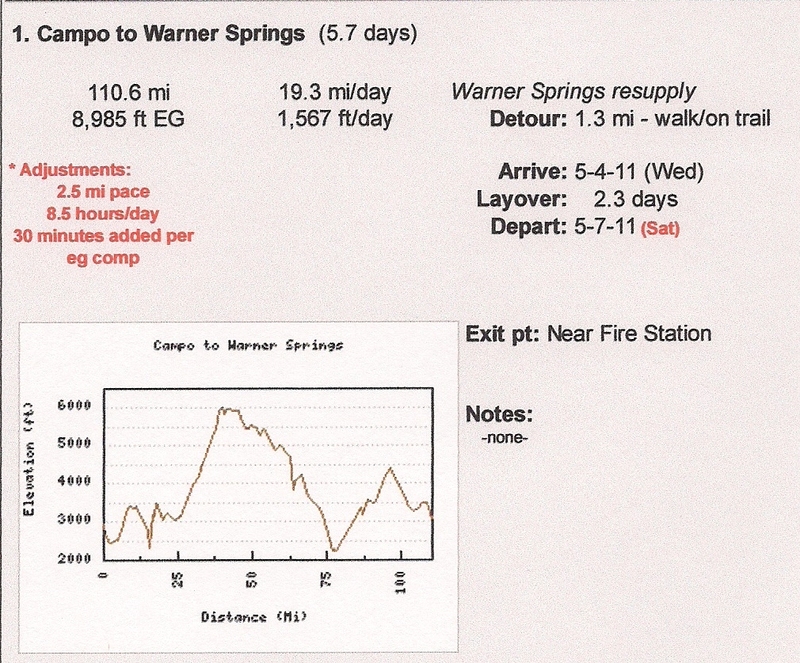 Here is an example of a section of my planned hike from the PCT Planner. My first 6 days of hiking mapped out on Craig’s PCT Planner. After I used the planner to determine my general trail towns and days between stops, I had to decide on a resupply strategy. There are two strategies for resupplying along the PCT. Some people will use the, “buy as you go” method. This is when you stop in trail towns along the way and buy at local stores. Some towns do not have large enough markets and that is when you plan ahead and ship an extra box from the trail to a destination a couple weeks ahead. With this method, you are given more flexibility in where you stop and you are better able to buy for changes in food preference and quantity over the five month journey. The disadvantage is that (in my opinion) it takes away from the enjoyment of trail towns and zero days(days spent not hiking). If I’m this stressed planning my meals from the comfort of my home, I’m sure it will only be worse when I’m tired, sore, and in an unfamiliar town. Since I would rather plan now than worry about it on the trail, I have chosen the other resupply method, which is to send drop boxes from home to myself along the way. Using the planner, I’m able to determine how many meals I’ll need between stops and I can pack my meals in boxes before I even set foot on the trail. This is a very daunting and draining task, but I know I will be thankful once I am carefree on the trail and getting the most out of my zero days. I also want to thank Dad and Robin for helping with this process by sending the boxes as I go! Some hikers don’t use this method because they worry that they will tire of certain foods and end up buying again later when they can’t stomach another night of Mac & Cheese. The other fear is all the extra food that will be sitting there taunting you if you don’t make it all the way. Anyone who knows me, knows that I pretty much eat the same four meals all the time and that they can coincidentally be categorized as trail food. My roommate recently remarked that I eat like a teenage boy. I have my older brother to proudly thank for that influence! Before I leave, I will be sure to do a journal post of what exactly I plan on eating along the trail. I will also be adding a tab at the top of my journal that will list resupply locations where I will be able to pick up care packages from friends and family. For now, I am happy that I have been able to vent a bit on this topic in hopes of avoiding a full blown tantrum later this week!